We haven’t had a post in a while, as most of the activity has been over on the facebook page, but I’ve got a few topics queued up, so hopefully I’ll be able to get back into the swing of it. First up is a 2-part test of Federal’s American Eagle Syntech. 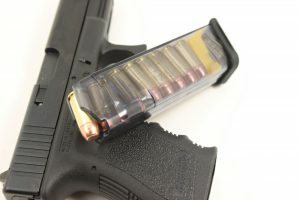 The main feature of this cartridge is a ‘polymer-encapsulated’ bullet. 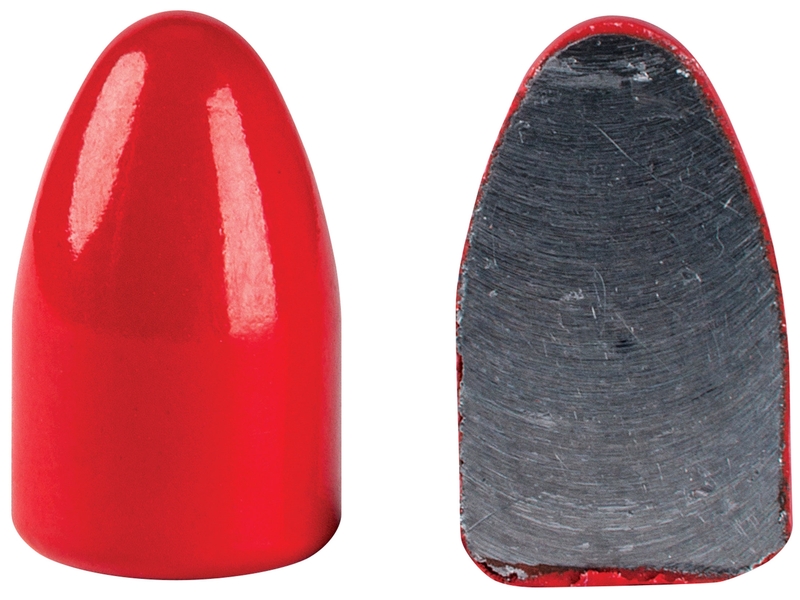 Like a Total Metal Jacket (TMJ) round, the polymer surrounds the entire bullet including the base. This is great for indoor ranges (especially those with poor ventilation) as it limits lead vapor. The advertised benefit of the polymer as opposed to a copper jacket is the lack of metal-on-metal contact leading to lower temperatures, and less copper/lead fouling. Additionally, the cartridge features clean burning propellants to further reducing fouling. Of course, that’s a common marketing statement in order to sell you overpriced ammunition – so I figured I’d put it to the test. At the time I tested this, I was only able to find the 115gr 9mm in stock, though they also sell this cartridge in 165gr .40 S&W and 230gr .45ACP. This limited some of the tests I planned to do, but more on that below. 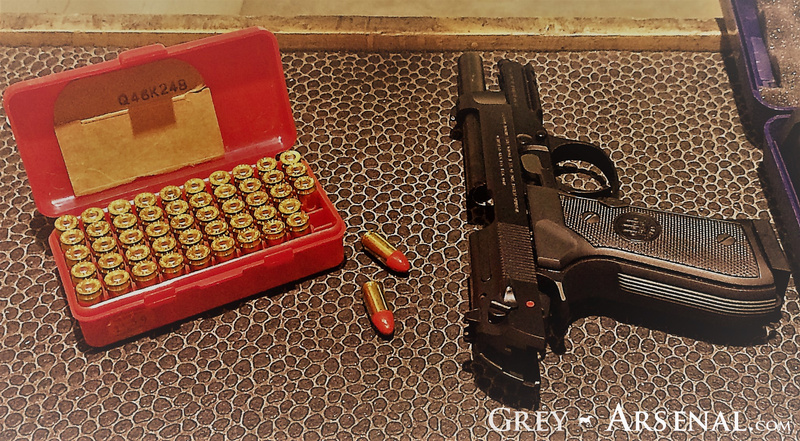 I decided to test the 9mm with a Beretta 92A1 that I shoot pretty often, so I could get a good read on the accuracy of this cartridge. 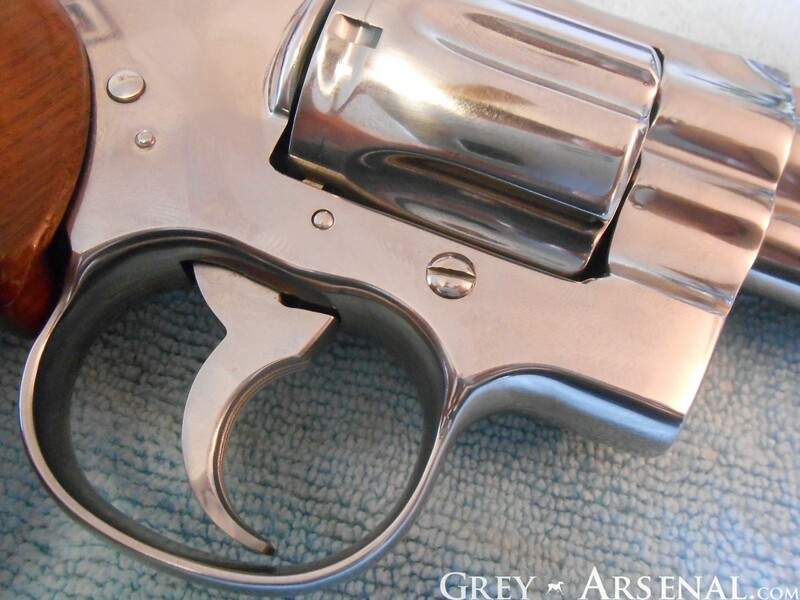 Additionally, it’s chrome-lined barrel would with judging the cleanliness. After the first magazine, there was only a touch of haze on the surfaces, but it still barely looked like it had been fired. Here was the results after the 50 round box. As far as I could tell, it did seem to have less buildup than the PMC Bronze I normally shoot, and consider pretty clean. This was significantly cleaner than some of the cheaper stuff I’ve used. Since this test I’ve used it a few more times, and the claim of less fouling seems to hold up. 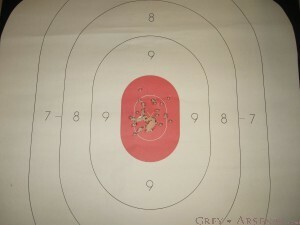 As far as accuracy – as to be expected with a premium priced practice ammunition, was pretty good. Definitely better than cheaper stuff like range reloads / Tula / Freedom Munitions / etc., but about on par with PMC Bronze / Winchester Train & Defend, at least as tested at 15 yards. 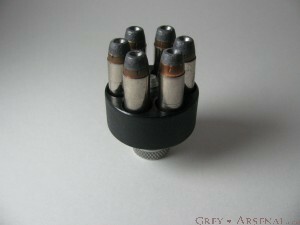 The ammunition also claims to be lower recoil thanks to lower friction – but I didn’t seem to feel any difference. As far as the lower temperature claims, it seems logical to me, but I wasn’t really able to notice a difference or do any empirical test to that end. What I would like to do, however, is get my hands on some of the .45ACP and run a magazine through a submachine gun, then test with a non-contact thermometer, and compare against some Federal American Eagle. I’d also like to see if the ‘clean burning propellants’ make any difference in suppressor fouling, especially since Federal makes an even more premium ‘American Eagle Suppressor‘ load. So keep an eye here or on our facebook page for updates. First off, let me apologize for the assault on your eyes that is the above image. It was created in MS Paint on a laptop via touchpad. If it has caused any bodily harm, please contact me and I’ll give you the contact information of my attorney. Okay, so there are a couple of fairly new contenders out there trying to give Magpul a run for their money on polymer magazines. 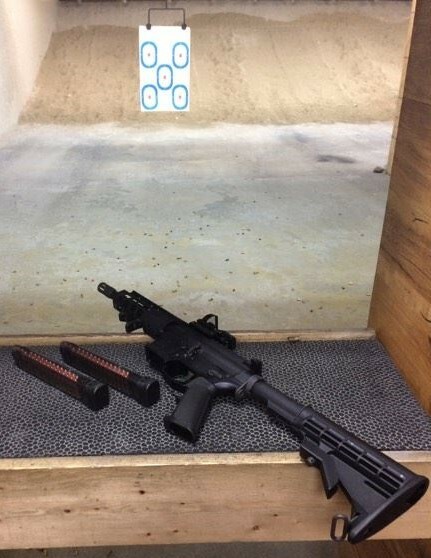 In a recent project, I tested Lancer’s L5 Advanced Warfigher Magazine, or “L5AWM” magazine in it’s most relevant 30-round configuration with my Windham AR. While these aren’t brand-spanking-new, they’re new enough that some folks I showed ’em off to hadn’t seen them yet or heard of them, whereas I’m sure any of them could’ve ID’ed a PMAG from a mile away. 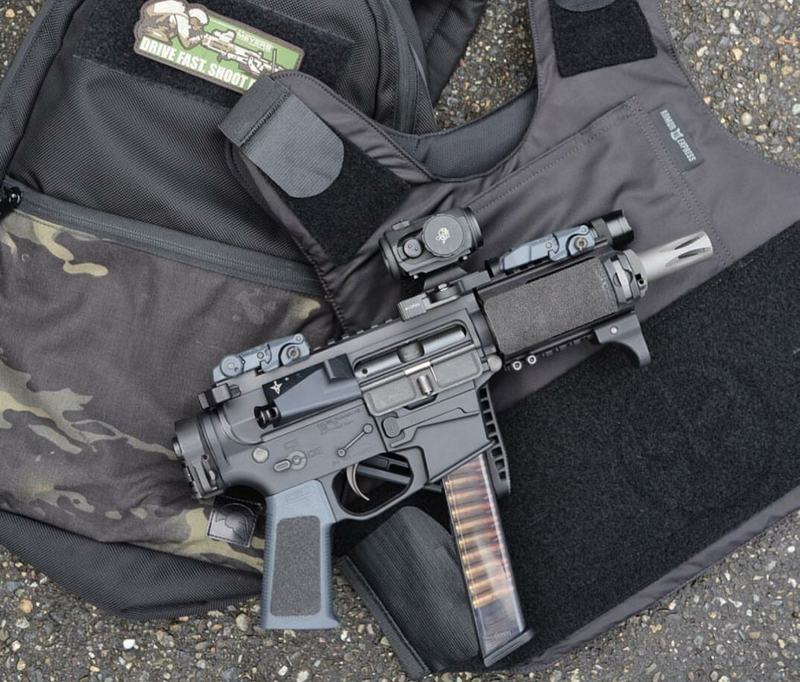 They have been getting some attention at SHOT and in other marketing venues, as I’ve been seeing them pop up in pictures of new ARs or platforms using STANAG type magazines, and seem to be the preferred magazine used in SIG’s marketing of the MCX. Of course it’s today’s SIG, so they probably just picked them because they looked decently sci-fi to go with everything else they’ve been doing lately. So, aside from looking futuristic enough for SIG, how are they? Pretty good, actually- Mine were the “smoked” color, which seems to be the most popular. It’s nice to get a visual read on your round count from any angle, and to even be able to quickly visually identify which ammunition is loaded, and not have an open slit on the side like the window’ed PMAGs. The material feels a bit harder than the polymer used by Magpul (and Troy), but doesn’t feel the least bit brittle or flimsy. 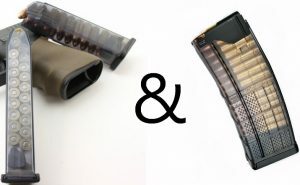 The metal upper, which gets these referred to as “hybrid” magazines, sets these apart, and inspires confidence. It also allows use of the standard loading tool when loading them from stripper clips. While this has gotten to be standard for other polymer magazines, it still feels nice to have that metal-on-metal contact when doing so. 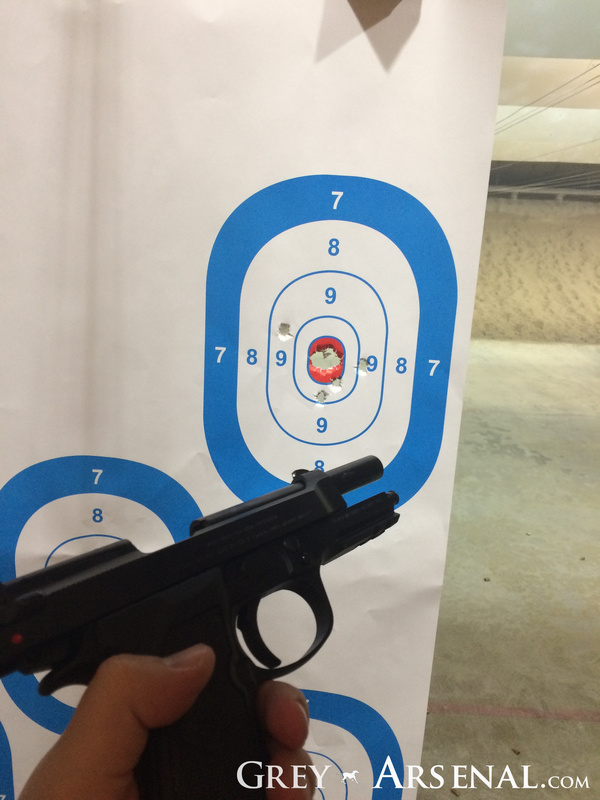 As far as actual performance, I’ve had roughly 1000 rounds between 3 of these and haven’t had a single failure. While that’s also singing praises to my Windham AR and the Federal XM193 ammunition being used, not having a single magazine-related failure over that span, even while trying to be a bit more rough than usual, reflects well on these. They were selling for real cheap for a while, and had been available from Wilson Combat on sale for ~$12 when I snagged them, but they seem to be hitting ‘Flavor-of-the-Month’ status with a price and stock level to reflect that. At the time of writing, they seem to be going for ~$20. 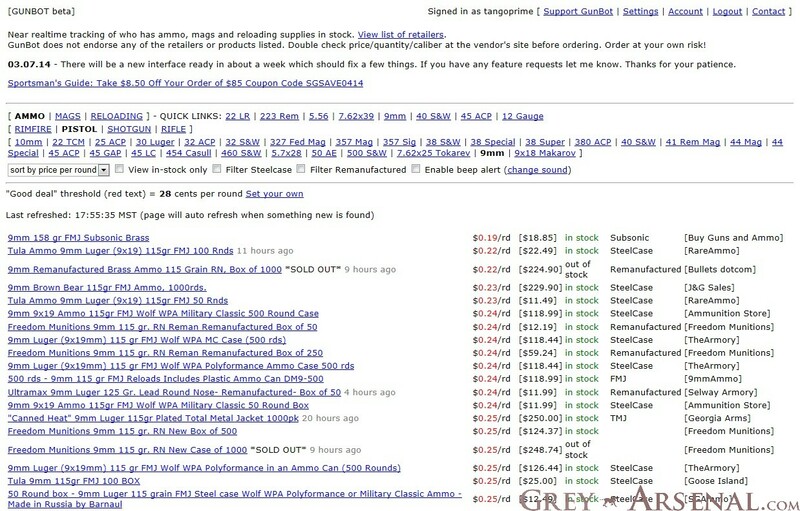 Edit: Also, happened to find this showing a drop test between these and PMAGs. Glad someone else decided to repeatedly drop their AR for our benefit, because I wasn’t about to test ’em that hard just for your benefit. Alright, so these actually *are* new enough that I can definitely call them new, as they seem to have just been announced last October and just started hitting the market around the time of SHOT. 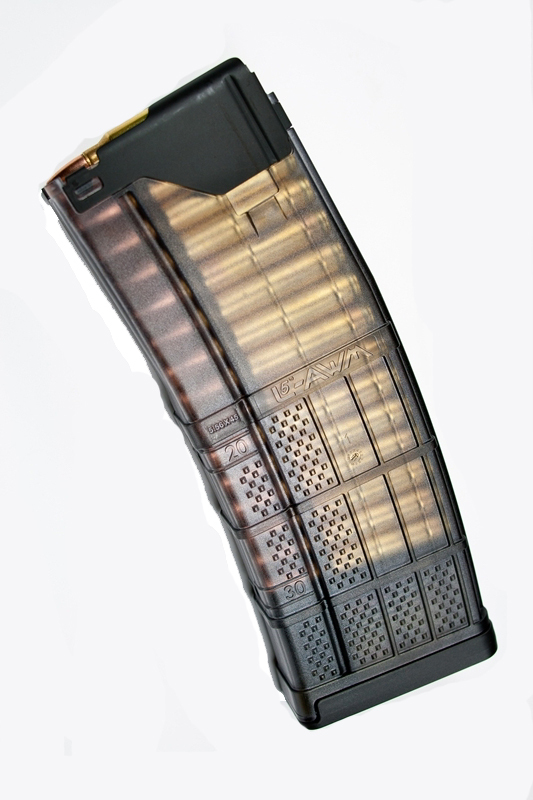 ETS (Elite Tactical Systems), in addition to another translucent polymer AR magazine, brings us translucent polymer Glock magazines. Currently available in a variety of sizes and capacities, generally made to match common varieties, that is, a 17rnd Glock 17 sized mag, 15rnd Glock 19 sized mag, 10rnd Glock 26 sized mag, and a 31 round Extended mag. They’ve also got 10-round limited varieties for folks in places where that’s required, and a 22rnd “Competition Legal” length magazine (140mm). 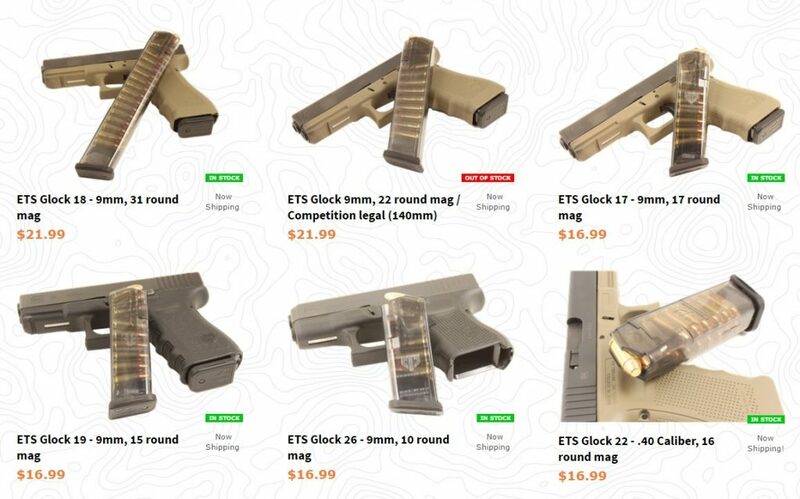 So, no matter what you’ve got as far as 9mm or .40cal Glock, they’ve got you covered. They’re also fully compatible with Glock OEM floorplates, and disassemble in the same manner, so feel free to slap a 7151 “+” plate and insert on there and get an extra round or two in ’em. Also, notably, they’ve beaten Magpul to the market, as Magpul has yet to release their Competition length and Extended magazines, which are currently scheduled for release this summer. Magpul’s offering also seems to be a bit odd in that they have a lower capacity in the same size magazines compared to both OEM and ETS, their competition, with extended magazines being 21 and 27 round capacities, respectively. They’re also not compatible with OEM or other aftermarket floorplates, as they seem to be proprietary. While I haven’t tested these as extensively as I have the Lancer mags, I can say, while my initial impression was a bit leery, due to the cheap-ish feeling polymer and what seemed to be a clearly visible thin-gauge spring, the 31 round magazine performed flawlessly in both my Glock 19 and a PSA 9mm AR pistol over the course of 350 rounds, with only a single FTF in the AR pistol which doesn’t appear to be a fault of the magazine. One notable quirk, however, is that while these drop free when empty, when fully loaded, they seem a bit tighter going into both platforms with which I tested them. 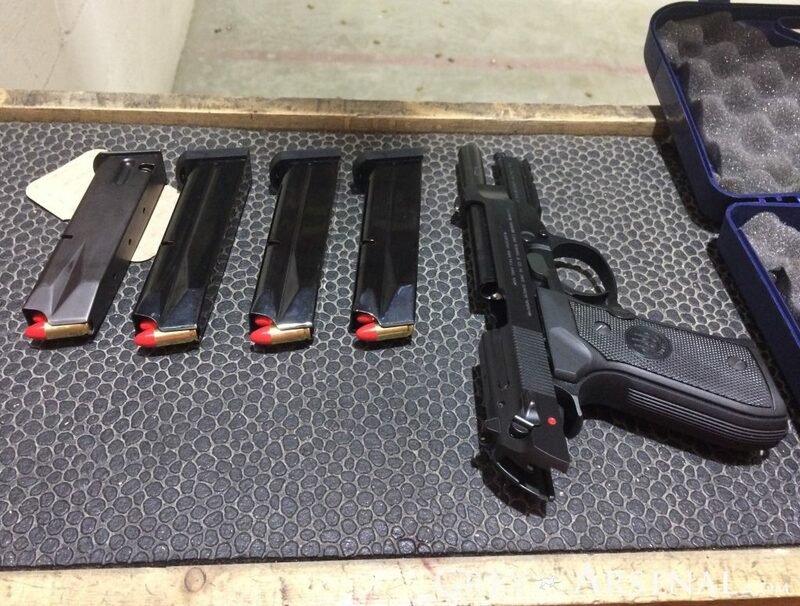 Not prohibitively tight or anything, but just similar to using magazines that don’t drop-free, kind of like I’ve experienced with some other (very cheap) non-OEM Glock magazines, or older G17 magazines. Loading one less round seems to have resolved this (30 instead of 31) completely, and I’ll update once I install “+” plates on both. 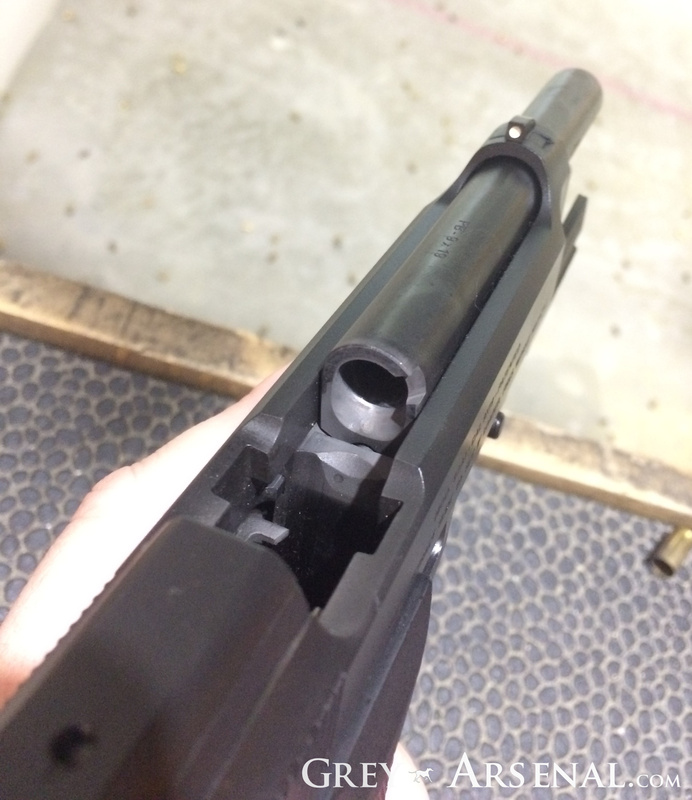 The company mentions typical marketing-sounding statements about being able to store loaded without worrying about the feed lips, and makes statements about drop tests, and I can confirm dropping and banging these things around both at the range and on an outdoor concrete slab wasn’t able to cause an harm to them in any way or cause any failures, but I just thought this was worth noting. At ~ half the price of equal sized OEM Glock magazines, I don’t mind using these for practice, but I’m not sure I’ll trust them for carry until I’ve had the chance to beat them up a bit more and see how they old up. Edit: Having now had about 1,500 rounds through them feeding an AR9 with no failures, I know they’re at least reliable at that, and they’ve held up to getting lightly banged around. It’s fairly common to shoot .38 Spl from a .357 Magnum revolver for practice or competitive shooting events, as it’s cheaper, and has significantly less recoil, without much difference in accuracy (despite the “jump” it has to make). 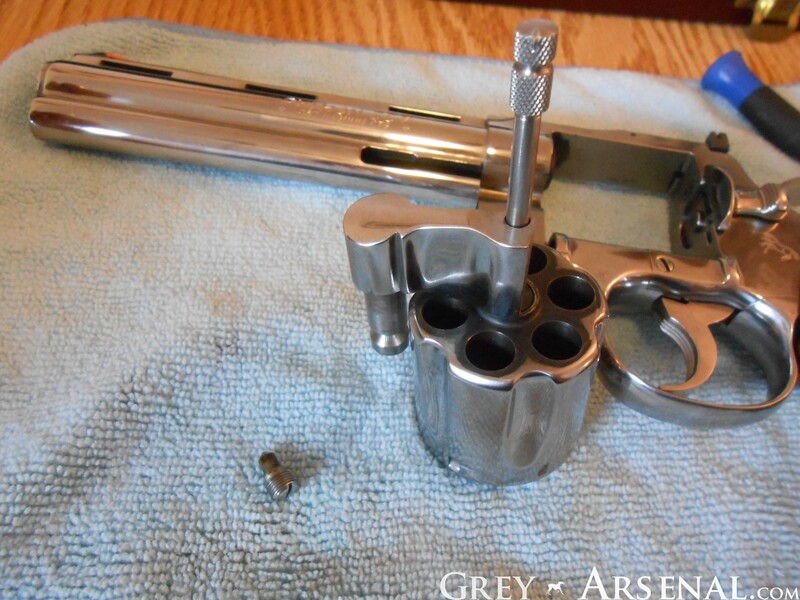 This leads to an often brought up topic of fouling making it difficult to load .357 Magnum cartridges after prolonged bouts of shooting .38 Spl. 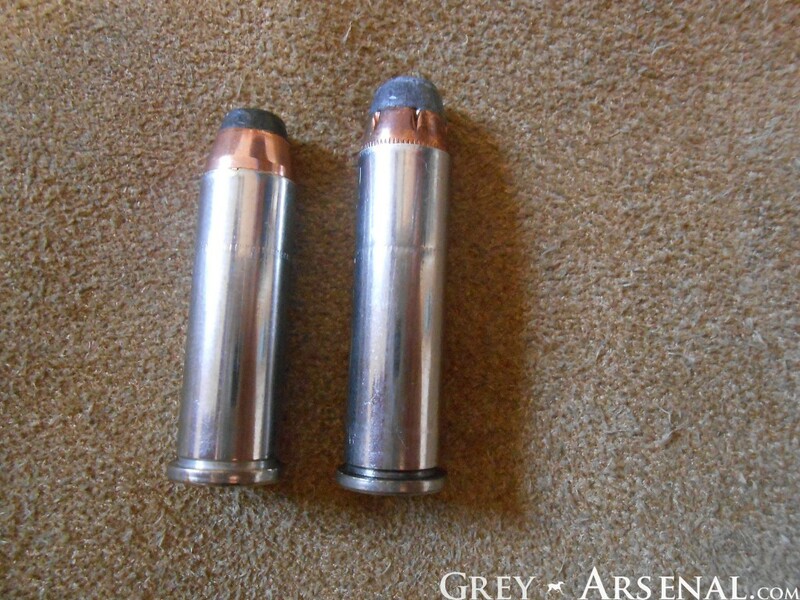 The problem comes from the fact that the .357 Magnum cartridge is a bit longer (and miniscule bit wider) than a .38 Spl cartridge. 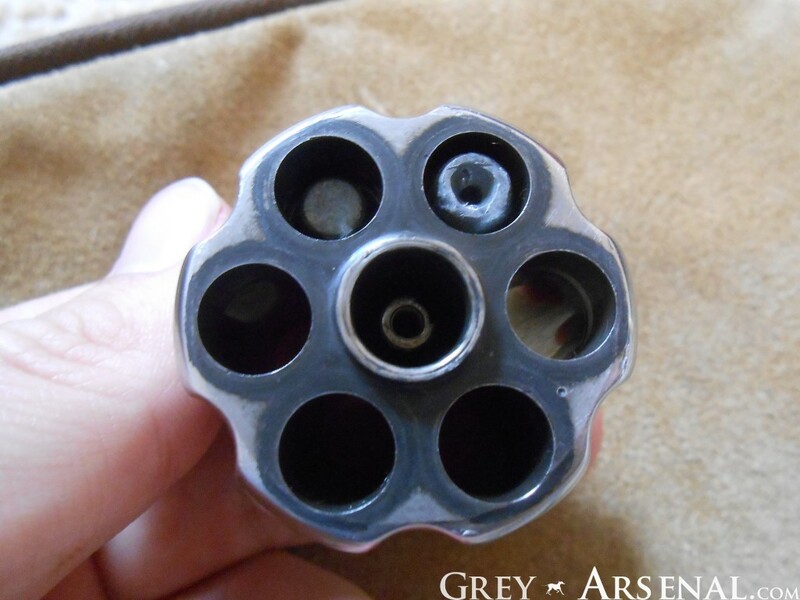 This means the .38 Spl bullet has to jump a bit through the cylinder chamber to get to the forcing cone and into the bore. 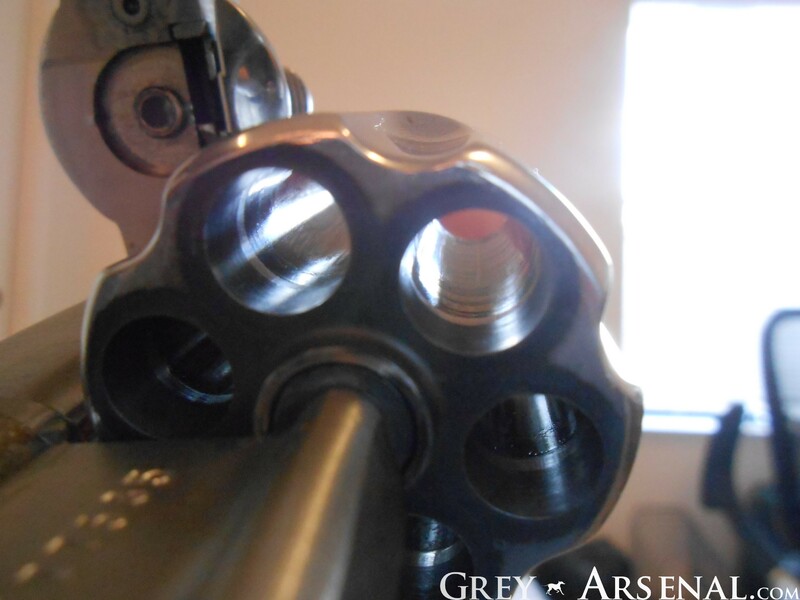 This means there will be fouling at a lower point in the cylinder, and that build up and burn in over time (sometimes even after a hundred or so rounds during one session) and make loading of .357 Magnum cartridges difficult to impossible. See the image below to see a ring of where this buildup was removed from the chambers. 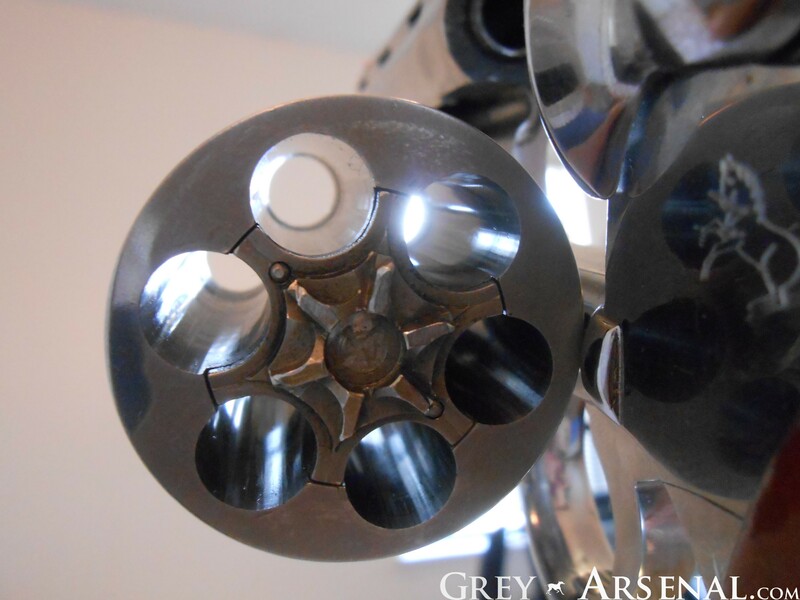 What you end up with is a .357 Magnum Revolver that doesn’t seem to want to accept .357 Magnum cartridges. Not cool. Luckily, it’s not permanent. 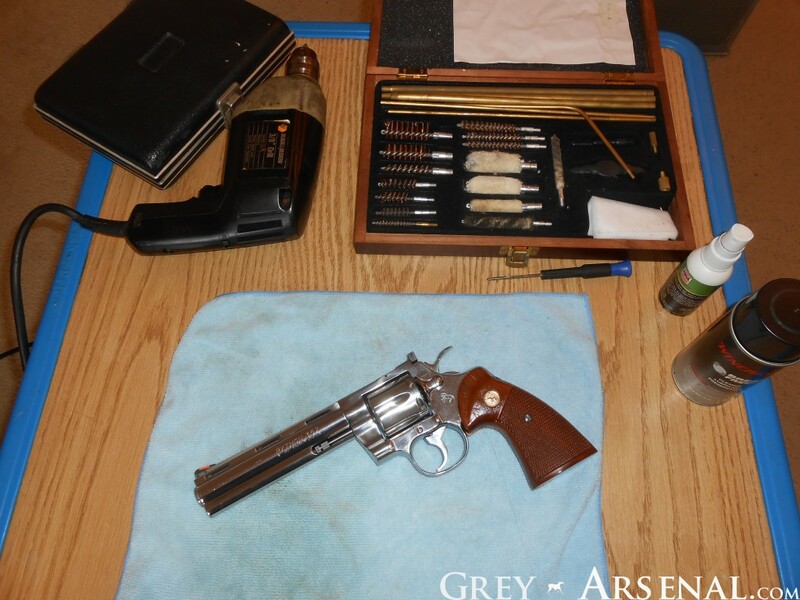 Even if cleaned normally after shooting .38 Spl, you still may need to go a bit further to remove this fouling. 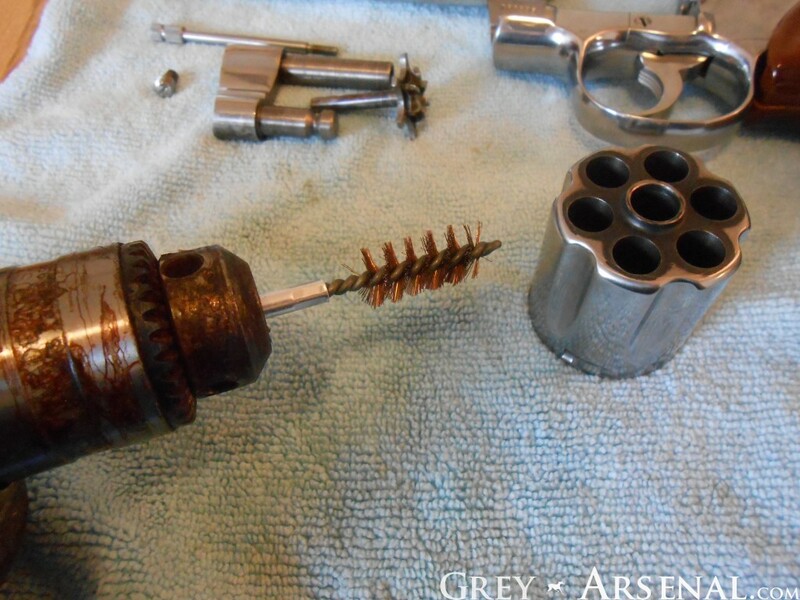 You could use a slightly oversized brass brush (for instance, a .40 S&W brush in a .357 Cylinder) soaked in solvent and just have at it for a while. A serious while. It takes A LOT of effort to remove this fouling this way. Luckily for you, I’m going to show you the easy (well, easy-ish, more on that at the end) way. 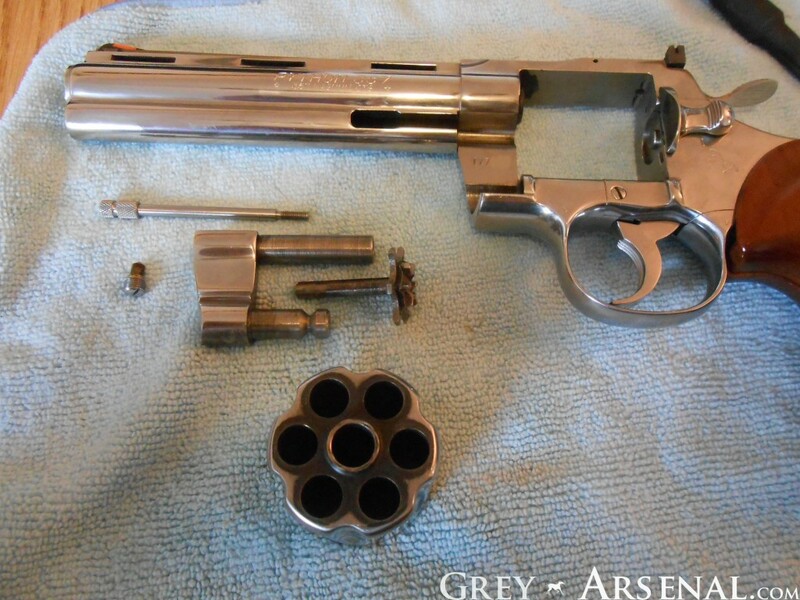 Naturally this will vary by firearm, but what you’re going to need to do is remove the Cylinder. 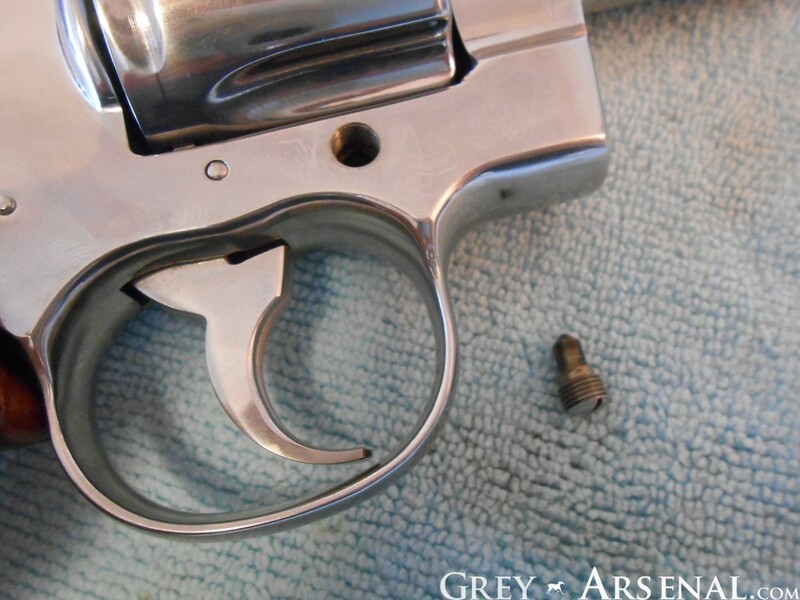 My sample here is a Colt Python, so here you’ll get a bonus Colt Python Cylinder Removal quick-guide. 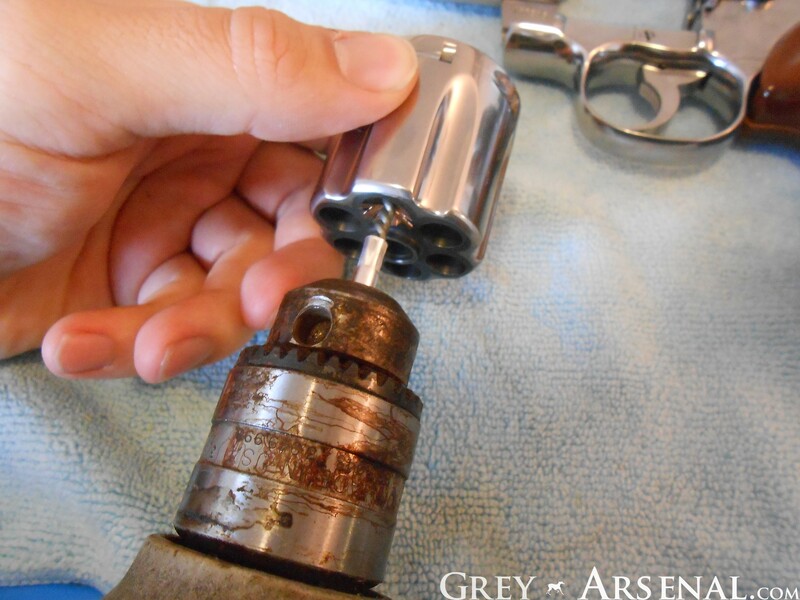 Remove by hand while minding that a very tiny spring and plunger sit inside of it. It’s not under pressure, but may fall out and be a PITA to find. 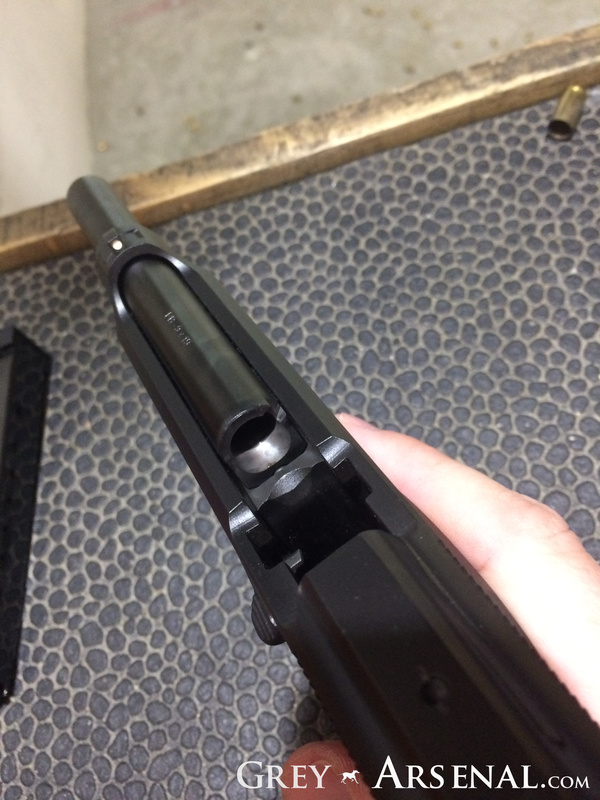 Use spur to open the cylinder action, and slide forward off of the frame. Unscrew the Extractor Rod and remove, along with the parts that are now freed up by this. Yes, that cylinder has some serious burn rings on the front as well. This Python may have the appearance of a safe queen, but she gets worked out quite a lot thanks to being such a pleasure to shoot. If there’s interest, I’ll do another quick article on getting THOSE rings off, but the long and short- lead remover cloth, or scotch pads and Hoppe’s 9. So, what we’re going to do here next is go ahead and chock that brush into your drill. Soak the brush in the solvent of your choice, and holding your cylinder in one hand and the drill in the other, get that brush in there and let ‘er rip. This may seem harsh, but the brass stands no chance against the steel inside of your chambers, you’re not going to damage it, but you will break up the fouling like a boss. For extra-bad fouling, you may want to tilt the drill a touch in circles to apply extra pressure, but not too much or you’ll bend up your brush too much. When this is done, you’ll have A LOT of dirty solvent all over that cylinder. Give it a good wipe and normal cleaning. Once that’s done, move to your test area (because I KNOW you didn’t have ammunition near your work space, right?) and let’s see what happens. Ta-da! 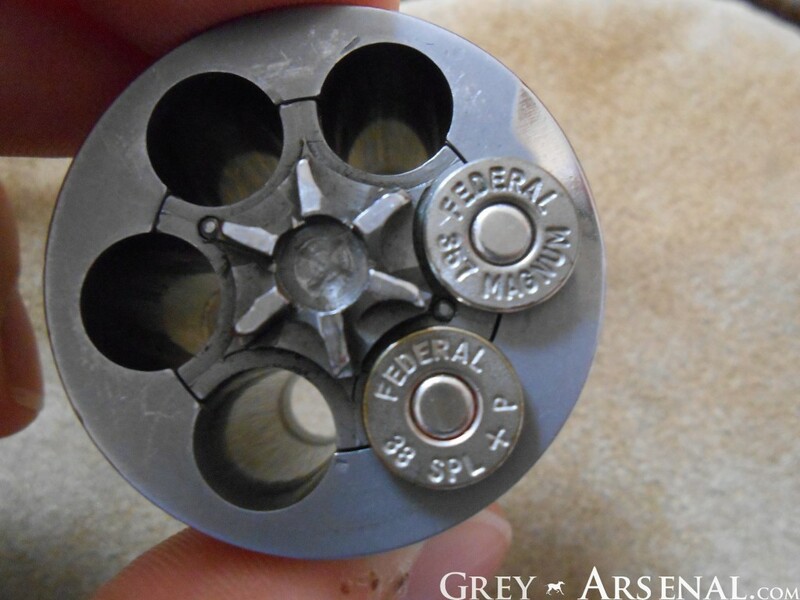 Your .357 Magnum is back to being a .357 Magnum. Now, about the EASIEST way of doing this that doesn’t involve jury-rigged powertools. Just buy this. Brass screen over a rubber piece will get that fouling out in one pass. Also works very well at cleaning bores and getting your forcing cone clean. 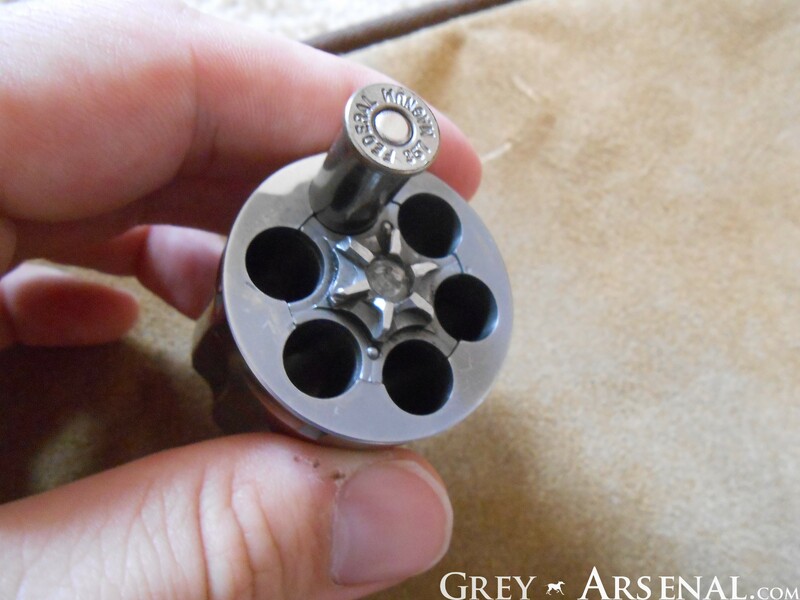 As a bonus, this is a 9mm size, it works for .38 / .357 / 9mm just like brushes / bore snakes, and one tool for multiple guns is always the way to go.